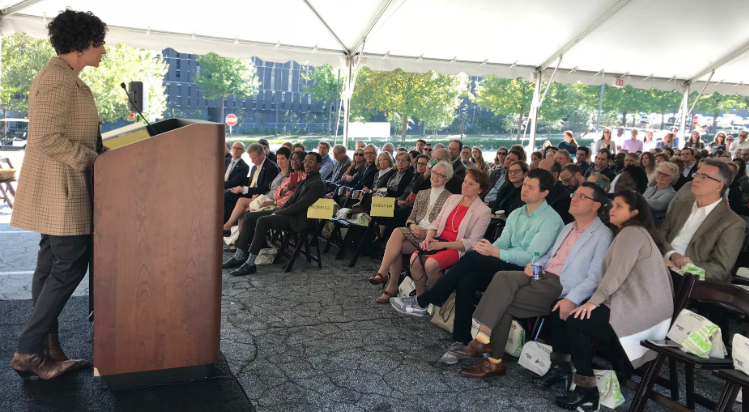 High ambitions for the Living Building at Georgia Tech were on full display at its construction launch this morning, which was attended by more than 250 people. There were no golden shovels in sight, as there might be at a typical groundbreaking. Instead, leaders from the university, the Kendeda Fund and the design team sowed wildflower seeds — befitting a project that aims to restore nature in the process of constructing a building. The event also marked the unveiling of the 40,000-square-foot structure’s official name: the Kendeda Building for Innovative Sustainable Design. It alludes to a common theme at the launch ceremony — that it’s more than just a building. Both Kendeda and Georgia Tech have set their aim higher than the already ambitious goal of creating a structure that meets Living Building Challenge standards. They want to “leverage” the project so that it helps to transform design and construction in hot and humid climates. One track toward that end involves creating a “living laboratory” for sustainable design and construction on the campus of one of the nation’s leading engineering schools. A broader leverage track is aimed at encouraging architects, engineers and builders across the Southeast to adopt regenerative design and construction techniques. Two years ago, the Kendeda Fund (which publishes this blog) bestowed $30 million on Georgia Tech to build a multi-faceted building according to stringent Living Building Challenge 3.1 standards. By most metrics, it will be the greenest campus building in the Southeast. 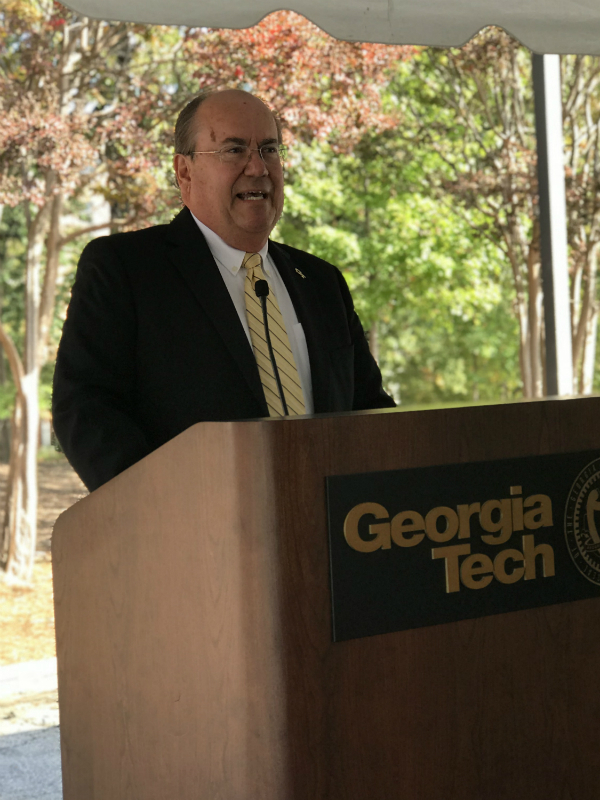 Georgia Tech’s Steve Swant speaks about his aspirations for the Kendeda Building. In photo above, Kendeda Fund’s Dena Kimball speaks to the launch audience. Both photos by Ken Edelstein. Last year, the university selected a design team led by LAS of Atlanta and Miller Hull of Seattle. Then, Tech chose Skanska USA as general contractor. Now, design documents are nearing completion, but the site itself still is a parking lot at the corner of Ferst Drive and State Street on Georgia Tech’s Atlanta campus. Before Georgia Tech was selected for the grant, Kendeda benefactor Diana Blank and other team members explored Blank’s vision to create a building that would serve as a catalyst for sustainable design and construction the Southeast. They researched Living Buildings in other parts of the country, visiting and speaking to designers, owners and tenants. Then, Kimball addressed her remarks toward local officials. She thanked them for their support for the project but also asked for their help in clearing the way for more sustainable projects. The event took place under a large tent on a part of the parking lot that will serve as an edible landscape just west of the building. Toward the back, was spread local sustainably grown (which probably didn’t hurt the effort to draw hungry students to the launch). There were also displays of honey bees (the building will include a rooftop apiary), materials to be used in the building, and an augmented reality app developed by Georgia Tech Professor John E. Taylor. It allowed users to walk, holding an iPad in front of them, east toward the part of the parking lot that will soon be removed to make room for the building. The use could then “enter” a rendering of the building and walk through the interior — an exercise, even more than the speeches, gave a sense to the launch that the building was just around the corner. And the entire event was all “off the grid” powered by solar thanks to Hannah Solar.